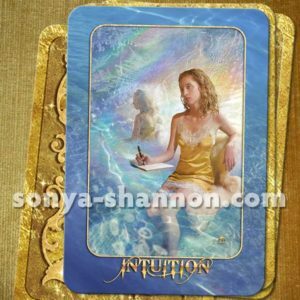 This seeker’s intention for this Chakra spread was to better understand her role in an active court case. Having suffered from a hit and run as a pedestrian, there was impact in all parts of her life. Along with several bumps, bruises, and a broken rib, she received a diagnosis of post-concussion syndrome. Financially insecure, still recovering from her injuries, and feeling the strain of stressful results related to her accident, many uncharted emotions and thoughts swirled in the seeker’s head. Uncertainty was the most present aspect in her life as the legal proceedings drew closer to a settlement. She requested guidance that would be in her highest good to deal with the unknowns of the outcome. Along with those intentions, the seeker expressed that a timeline for resolution would be helpful. 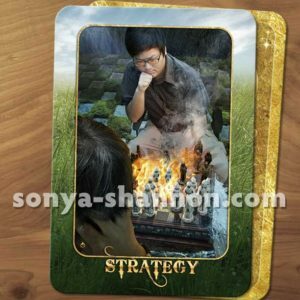 STRATEGY (Air | Growth) – At the 2nd chakra, the home of emotions, relationships and self-worth, the card is Strategy. When in alignment, this chakra carries passion and trust. Out of alignment it may bring rigid beliefs, resentfulness and feelings of inadequacy. This card reflects the mental state of the seeker to plan her next moves. Through cautious contemplation, the seeker may need to examine what absolutes within her belief systems are no longer serving her. With many variables to consider, take time to understand the board. The duality speaks to what reaction is in the seeker’s highest good. There are possible reactions that will be of great benefit, while others may be foolhardy. Examine options and make these decisions with emotional stability and self-worth in mind. 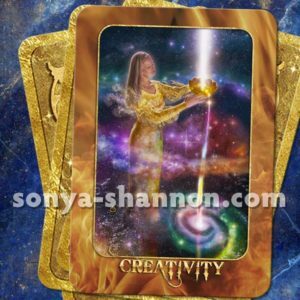 CREATIVITY (Fire | Nourishment) – The Creativity card arrived at the 3rd chakra. The 3rd chakra holds personal power, will, self-esteem and happiness. When this chakra is charged with positive energy, confidence and feelings of empowerment are easy to tap into. For the seeker, her sense of powerlessness, anger and confusion arise from the 3rd chakra imbalance. As she learns to navigate the new ways of doing the everyday things that are persistent challenges in her day to day life, she will discover what works for her. Her connection to Source is represented by the Divine Light that flows into her bowl, a symbol of the soul, and overflows into unlimited possibilities. This energy has prolific potential as a balanced expression of self that may serve as expansion for the soul. By accessing the creative power of the Universe, the seeker can find her own creative gifts and then apply them to her new circumstances. By knowing and following the truth of herself, the seeker may find her sacred path, allowing her to use the Divine Light in a nourishing, positive way. 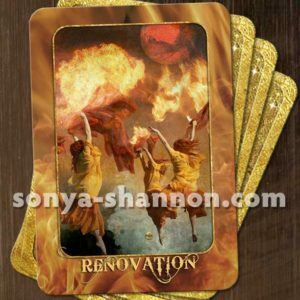 RENOVATION (Fire | Ending) – The heart, at the 4th chakra, gets the Renovation card. The heart is the home of love, understanding, hope and forgiveness. To avoid feelings of despair and unworthiness, the seeker is invited to consider how her new outlook and beliefs allow her space to grow again. After her “trial by fire” she may find herself dancing in a circle of wholeness. The flames burn away that which is no longer needed. Mars symbolizes breaking down of obstacles. From the space cleared, the seeker can now hoist a torch to a fresh cycle of opportunity. It is all upwards from here! ASCENT (Air | Refinement) – Ascent brings refinement to the 5th chakra, found at the throat area. After the fires of Renovation have burned away that which does not serve, the lasting affects of the fire allow the seeker to leave unwanted baggage behind. 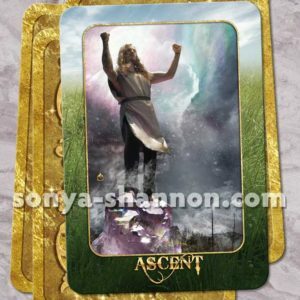 Climbing to the top of the mountain, the seeker rises above negativity, balancing the feminine and male energy to become the authentic expression of self. The time has come to share her inner voice. Prepare to teach what she knows, to share her story with the world. CONNECTION (Water | Nourishment) – At the 6th chakra, the third eye, Connection with the All That Is will be nourished. The seeker can look from her closest circle to the breadth of the cosmos to find connections. Love and the Divine can be found in the aura of the Earth, as well as within herself. By the connection to so many things, the largest of obstacles can be overcome. The highest aspects of herself will become part of her consciousness, bringing a vision of oneness, while maintaining balance of male and female energies. INTUITION (Water | Quietude) – The 7th chakra, located on the crown, shows that Intuition may lead to transcendence. 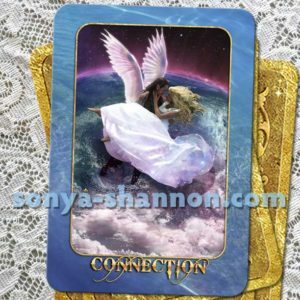 Through quiet meditation, and reflection from the 5th and 6th chakra cards, the seeker may strengthen her connection to Spirit ever deeper. The symbols speak to her emotional life. During waking hours she may find herself still connected to the astral planes in order to journal her experiences. By bringing those symbols into her third dimensional reality the seeker will maintain a stronger relationship with All That Is. By surrendering, planning and fueling the creative fires, the seeker will find peace while this phase of her court case works out for the best. While ridding herself of undesirable thought patterns and ties, she may find her heart free to move towards her highest good without obstacles. With an expanded connection to self and Spirit, the seeker will discover a deeper relationship with both. Get a reading with Jason! 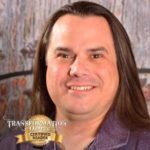 Watch Jason’s video to learn how to read The Phases of Transformation.